The Black Sage is a text adventure game based on the pen-and-paper role-playing game Tunnels & Trolls. It was developed and released in 1980 by Poly-Versa-Technology for the Apple II. It is actually an unlicensed game that draws heavy inspiration from Tunnels & Trolls. 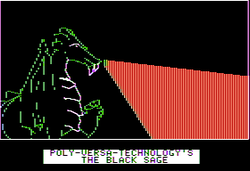 The Black Sage is subtitled An Ogres and Orcs adventure because it was supposed to be the first in a series of similar text adventures for the Apple II, but it remained a standalone game. Almost 30 years later, Tunnels & Trolls Adventures resumed the spirit of The Black Sage, with new chapters released periodically. You are an adventurer (of unknown backstory) who is going to enter the castle of the Black Sage. His/her goal is just to get riches and find an exit from the castle. The Black Sage is a text adventure. Instead of a text parser, the player is given a choice between four actions in every room. Said actions will lead to a pre-determined outcome, unless they imply a dice roll against an attribute of the character. Full review on the Computer Role-Playing Games Addict blog. Comments by the followers help overcoming some bugs, and show the link with the Tunnels & Trolls franchise. This page was last edited on 27 November 2018, at 15:13.